A quaint town called Turner Valley in Alberta, Canada may not mean much to the current crop of oil and gas industry observers. However, it has a special place in British history as well as that of the industry itself. Back in 1914, the town acquired the status of Western Canada's oil hub and had the country's first commercial oilfield which, for a while, was the largest oil and gas production base in the entire British Empire as it stood then. Hell’s Half Acre by David Finch is a meticulously researched and entertaining tale of the townsfolk of Turner Valley, and those who came from further afield to make it all happen back in the day. The author, who has been researching the social history of Western Canada’s oil and gas industry since the 1980s and has no fewer than 15 books about the region to his name, recounts where it all began in earnest for the province. The drilling rigs, processing plants and pipelines are all there, and so are anecdotes of the wildcatters and workers who put it all in place, who made it happen and who lived to tell their tales. In order to make for a lively narration, Finch has gelled archived material and the dozens of interviews he conducted extremely well. But this pragmatic book of just over 200 pages, not only narrates a tale of commercial success, but also what costs were paid by Turner Valley in its (and by default) Canada's historic quest for black gold; an effort, which as fate would have it, was sandwiched between the two World Wars. Hell's Half Acre is a very real place in a coulee just outside of Turner Valley, writes Finch. For two decades, companies piped excess natural gas to the lip of this gorge and burned it – in order to produce valuable gasoline they had to also produce the natural gas for which there were limited markets at the time. In fact, the glowing sky could be seen as far south west as Calgary, the author tells us. Canada's national treasure also became a military target for while. At its height, and before peaking in 1942, the Turner Valley provided 10 million barrels per day towards the Allied War Effort. As you would expect, what was then (and still is) a cyclical industry saw its own booms and busts. The companies and their cast of characters from Turner Valley have also been delved into, and in some detail, by Finch. The Oilholic first came across this book on a visit to Calgary and a chance visit to DeMille Bookstore at the recommendation of a local legal expert. For that, this blogger is truly grateful to all parties concerned, and above all to the author for enriching one's knowledge about this fascinating place. Hence, this review was long overdue! Today Turner Valley, a harbinger of the success of Canada's oil and gas industry, is known for tourism, leisure and for being the hometown of Laureen Harper, the frank and vivacious wife of Prime Minister Stephen Harper. So Finch's colourful book could serve as a timely reminder of the importance of a bygone era as Turner Valley begins the countdown to its centennial celebrations of the 1914 discovery of oil. 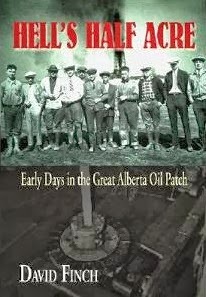 The Oilholic is happy to recommend this book to all those interested in the history of the oil and gas business, origins of the Canadian energy industry, Alberta's place in the global geopolitical oil and gas equation and last, but not the least, anyone seeking a riveting book about the Great Alberta Oil Patch.